Sub:- Selection process for engagement to all approved categories of GDS posts – Review thereof. 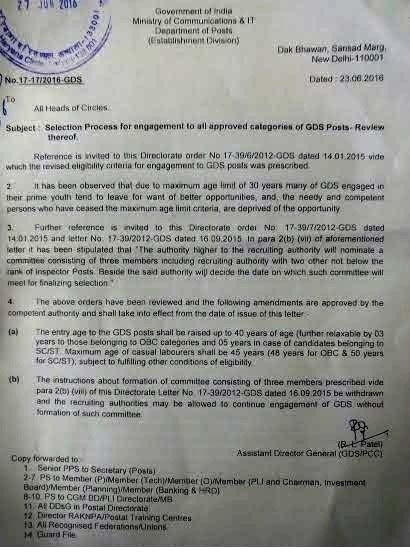 Reference is invited to this Directorate order No.17-39/6/2012-GDS dated 14-01-2015 vide which the revised eligibility criteria for engagement to GDS posts was prescribed. 2. It has been observed that due to maximum age limit of 30 years many of GDS engaged in their prime youth tend to leave for want of better opportunities and the needy and competent persons who have ceased the maximum age limit criteria are deprived of the opportunity. 4. The above orders have been reviewed and the following amendments are approved by the competent authority and shall take into effect from the date of issue of this letter. (a) The entry age to the GDS posts shall be raised up to 40 years of age (further relaxable by 03 years to those belonging to OBC categories and 05 years in case of candidates belonging to SC/ST. Maximum age of Casual Labourers shall be 45 years (48 years for OBC & 50 years for SC/ST) subject to fulfilling other conditions of eligibility. (b) The instructions about formation of committee consisting of three members prescribed vide para 2 (b) (viii) of this Directorate letter No.17-39/2012-GDS dated 16-09-2015 be withdrawn and the recruiting authorities may be allowed to continue engagement of GDS without formation of such committee.